Sometimes it can be hard to find the time commit to difficult DIY tasks. Days run into weeks and you grow to accept the half-painted hallway and plastic covered furniture. Then one day you snap and end up hiring someone to go over the paint job and make it all just go away. Don’t worry there’s plenty of cheap and easy jobs you can definitely do in less than a day to restore faith in yourself. No matter how challenged you are in the home improvement department you could have any of these 10 DIY jobs done by tea time. Let’s start with easiest fix for the most annoying of household problems. The squeaky door that grates on your nerves each time you hear it. It’s very simple, dab, pour or spray some cooking oil or WD-40 on to the metal hinges and rock the door back and forth to ensure it drips in. This will work for a while as a temporary solution but you may need to unscrew and sand down the hinge in future. 2 – Does It Slam Shut Too? Does your door not only squeak but also punctuates this annoyance with a loud bang as it slams shut? For a simple and quick solution, fix a small bit of tape over the tip of the door stopper or a rubber band running from handle to handle (but not over door stopper). Spruce up the inside of your wardrobe by painting your wooden hangers and you’ll be jumping out of bed to get dressed in the morning. 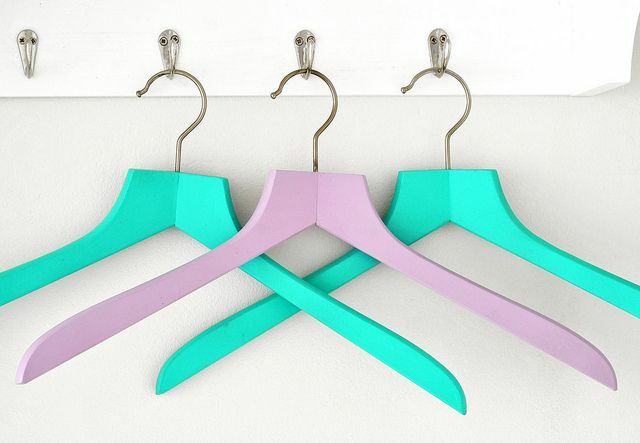 Lightly sand down hangers if needed then use different colour spray paints. Be creative. Just don’t forget to let the paint dry properly before using them! 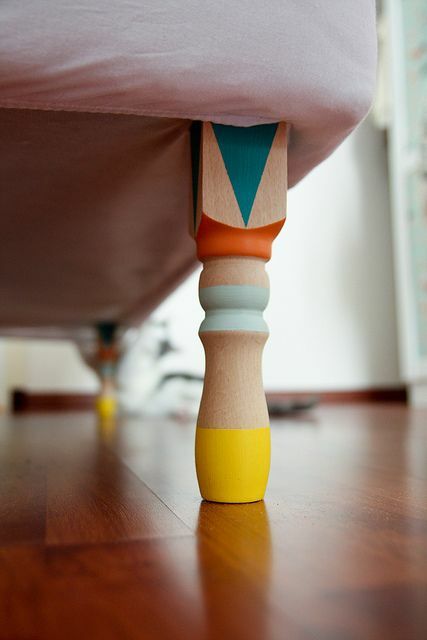 Paint your bed legs too. You will need to turn the bed frame over to unscrew the legs (if they’re removable), then use tape to mark the areas not to be covered in paint and wood varnish once it’s all done. It’s amazing what a difference some ornate handles and knobs can make to your kitchen. Unscrew all the cabinet knobs and drawer handles and add in some new ones to add a bit of colour or class. Make sure to bring a few of the ones you’re replacing to the hardware store for sizing guidelines when you pick out your new fixtures. 6 – Flat And Saggy Couch? Does your couch look a little deflated? Cheer it up by replacing the stuffing. Measure your cushions for the length and width and buy the correct amount of poly fill and upholstery foam. Depending on how saggy the cushions are you may need to replace the filling completely or just adjust them slightly. There are countless options for putting up shelves in your home. From hanging a gorgeous piece of wood from the ceiling to upcycling an old ladder, from gluing a small soap dish to the bathroom wall to erecting a customised shelving unit. The options are endless. We love these bookshelves. BOOKshelves see? 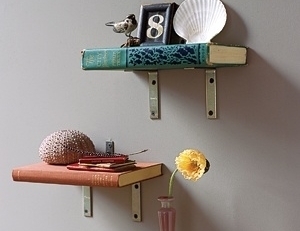 Easy to do using only brackets, screws and your favourite sturdy books. 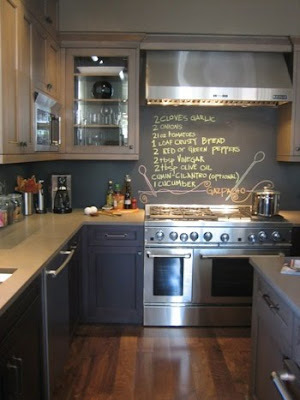 Chalkboard paint is very trendy right now with restaurants and bars but it looks great in the home too. Great fun in the kids playroom, handy in the kitchen for shopping lists and menus and stylish in unexpected places like in place of a mirror in the bathroom or on the back of a door in the hall. You could could build a colourful brick-edged path to welcome your partner home from work or build a border for your plant beds. Using a straight edge spade to dig your spot and as many bricks as you need this job is quick and easy. You could use any mismatched or broken bricks you have lying around for a rustic look or buy new ones in your chosen colour. A fresh coat of white paint to the skirting boards in your home is an easy, cheap and instant way to brighten a room. If you’re feeling adventurous then change it up a bit with some colour or decorative design. Just remember to prep properly with masking tape and sheets to cover the ground. ← Are You A Bath Or Shower Fan?